Before I started to write this I did a bit of googling (something I love doing !) just to check if there was any research behind holding a plank. Stuart McGill (back specialist) was quoted on one website as saying 2 minutes is the gold standard, yet on another saying he believes that it is better to hold for 7-10secs, rest for 2-3 then repeat!…. On his website I could’t find much about it. Therefore it seems there is confusion as to whether to hold a plank at all and if so for how long. My question is WHY? Why do we need to be able to hold a plank for let’s say 2 minutes – or even 1 minute? I was thinking what in daily life do we do that requires us to hold our core on deeper than it is in generally on in normal life, i.e. in a static position for 2 minutes. I drew a blank. I went swimming – maybe if I could hold a plank for a really long time my body position in the water might improve? Well only if I can hold it well and move my arms and legs.! I was in the kitchen cooking – a chef maybe?, is a long plank hold functional for them – if you can hold the core horizontal it must translate to vertical right? Not really and also chefs are always moving their limbs and are not static, same with many other standing professions. What do we do in life in the plank position apart from erm, a plank. My point – I struggle to understand the need to be able to perform a plank for a length of time, least of all put it out there to the general population as a 30 day challenge. Do we want to be able to support ourselves in a plank? – yes – with good form and with the rest of the body assisting – strong legs, shoulders in place, elbows not hyperextended etc etc, it is not just the ‘cores’ job (please use your own definition of core – it would be another blog post to go into mine…..). I watched a random dude hold his plank for 5 minutes – I actually didn’t watch; I forwarded the video, but during that time he fidgeted, he moved his head up and down, rocked forward and back, then his knees started to buckle and his back sagged a little – but great he did 5 minutes!!….. Does that count – the fact he fidgeted so much and lost form? Not in my eyes. Hoping you get my drift here. When these type of ‘fitness’ challenges are put out there – please ask WHY? What is the point and what does it provide for in daily life. A plank is an awesome position to be able to get into – it allows us to then say do push ups efficiently, it teaches our body to work in a different relationship to gravity than normal, it takes the load of gravity off our discs, it helps with shoulder strength and placement – which can help yogis /gymnasts for example with arm balancing poses, it can teach the body to work as a unit and not just the ‘core’ (insert own definition) – if it is taught well !!! and other reasons I’ll leave you to think of. Do we need to hold it for ages? My opinion – no; unless you want to break the world record which stands at over an hour or something equally stupid..
What are we better of doing? Move in and out of the plank – when you can get into a plank successfully each time, then hold it and move – lift a leg, move an arm forward, touch you head with your right hand, heckle; get someone to push you about a bit (thanks Frank Forencich for that – http://www.exuberantanimal.com) – lift you head up and down, look right and left. Add props – elbows on a ball, feet on a Bosu, use other equipment e.g. pilates reformer, drag a Vipr along the floor, do a Kettlebell row in a plank. 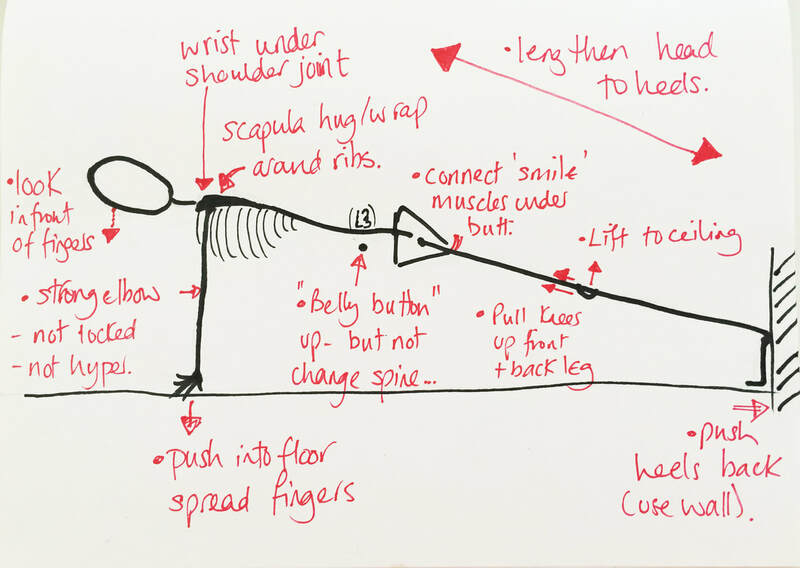 Go to a side plank – then centre, then the other side – which way is easier? Learn something about your body’s ability side to side!. Go from plank to down dog to plank to swan/up dog to plank to side plank – play – move – explore the space around your plank!!!! My artistic talents are infinite as you’ll have realised from my drawing above,.. My stick man plank with a few notes on focuses! Biggest issue is often the head placement – many people go into ‘chicken head’ pose and their face/head drops forward to the floor. A good visual here is to imagine (or put!!) a mirror on the floor under your face – you need to be able to see ALL of your features as if you were looking into a mirror standing up – and at the same time keep your face away from the mirror – but not so far you get double chins!!…. Please no comments about dimensions of my man/woman – it’s not about my ability to draw.! !